“Mommy! Max was playing with bugs and he picked up a grasshopper and put it in his pocket!” I looked at my little two year old daughter like she had just spouted off the Pythagorean Theorem. I was all sorts of confused. Did my child just tell me something that happened? She went on to tell me more about what she and her friend had done together. Voluntarily. Without me asking 20 questions first. She just offered up intel! Kaitlyn followed Brayden, my oldest. Getting Brayden to offer up information about his time away from me was like trying to convince a cat to follow you. It happens by accident sometimes! Not that Brayden was hiding anything. Boys can just be hard to get to talk. There is a lot of debate out there about differences between males and females. Are there differences? If so, are they caused by nature or nurture? There is a large camp that believe that any differences displayed by the two genders is simply a result of the way parents and society treat the children from birth. There are also, however, studies that show that girls and boys learn differently–their brains are used differently. I happen to be one who believes boys and girls are inherently different. Are there impacts of nurture on each gender? Sure. I definitely believe nurture can impact a personality. We wouldn’t put the time and effort we do into parenting if we thought nurture was of little consequence. I also believe that nature has a big impact on who we are. Girls are inherently different from boys. There are obviously outliers. Some boys are chatterboxes. By and large, however, the generalities hold to be true. Growing up, I always related to males more than females. Why? I am not sure. I have no brothers. I just, by nature, and more “chill.” My oldest is a boy. I then lost a baby boy, solidifying my belief that I would be a mom to all boys. Maybe one girl would come my way, but I would for sure be a boy mom. And yet here I sit, as my oldest is about to turn 12, with one boy and three girls :). My next door neighbor has eight boys and one girl, so we often talk about and observe the differences between boys and girls. I think you notice the differences a lot more when you observe them in your children. It is interesting to see their difference in their nature when the nurturing aspect is essentially the same. There is something so sweet about girls. With this post, I don’t intend to speak negatively of one gender or pit them against each other. There are great virtues to be found in each unique quality. My intention is simply to point out the what has struck me as the starkest contrasts between the two genders. So what are the differences? Here are the top five things that have surprised me about a girl–the things to be prepared for if you are about to have a girl. Now, not every girl will be all of these ways, and some will display these characteristics to higher degrees than others. They are generally true, however. This is a huge stereotype, right? Girls talk a lot. 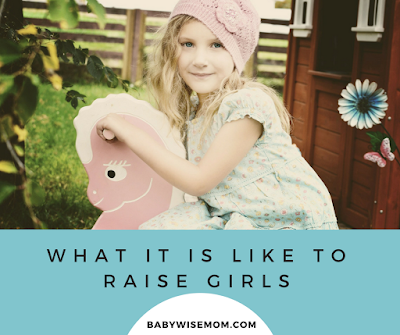 This is one of my favorite things about girls, personally, because I love to talk and as a mom, I love to know what is going on when I am not around my child. My two year old Kaitlyn came inside and told me about the time she had just spent playing outside with the neighbor boy. She went on and on, filled with details, and ended with, “Max at a bug!” I sat, really, in shock. I think she had just filled my ears with more information about her one afternoon than my then four year old son had given me in all of his afternoons combined! I called my neighbor up and told her all of the news I just received. “Can you believe all that she told me?” My neighbor, remember the one with 8 boys, was also surprised. We were used to boys and their general lack of sharing information. Remember, this is in general and there are always exceptions. Girls talk, and girls talk freely. So long as you don’t do anything to stop her from talking, she will freely share detail after detail about her day. Compare this to my son who manages to create a one word answer even to my college-trained open ended questions. Why is he this way? Why are my daughters so talkative? My answer is nature. It is innate. It is a stereotype for a reason. I have read psychology books on boys and why they don’t talk, and the popular road to take is that boys are suppressed from expressing themselves, so they learn to not talk…I promise you I have done no such thing. Can we get boys to talk? Yes! We can do tricky little things we have read about, studied, and practiced over the years. Girls, however, are just bursting to share their information with you. No tricks nor strategy required. A tip for the talkative girl: remember girls tend to like full attention when you talk to them. While boys (and men) can feel uncomfortable with you sitting and looking at them straight on while they talk to you, girls prefer this when they are talking (unless it is an intimidating topic–then doing something like washing dishes while talking can be a good idea). I have two extreme girls in the movement department. One has always been, even from the womb, a very still child. She was so still I worried if she was okay in there. Another has always been, even from the womb, a mover and a shaker. They both are this way to this day. But they both can and do sit still. It is not a challenge for them to sit and color, sit and listen, or just sit in my lap. For this reason, girls are often, really, just easier in a lot of situations. Church with a toddler girl is so much easier than with a toddler boy! Anyone who was or is an elementary teacher can tell you how much boys need to move around and expend that energy. When McKenna was four years old, she was in a playgroup with eight children. Seven of them were girls. These girls, ages 3-4, could easily sit for the 1.5 hours of playgroup and do crafts, coloring pages, listen to stories, etc. The boy actually did quite well for a boy, but was always anxious to move on to the next thing–especially playtime! Can boys be taught to sit still? Yes! As parents, we have many tools at our disposal for teaching about self-control and sitting still. But if you take my incredibly obedient first-born son and compare how easy it is for him to sit still to my rambunctious seven year old girl who loves to “test the waters,” she still has an easier time of it, even with her disposition to be a mover and a shaker. A tip for the still girl: A downside to the sitting girl can be getting her to get up and do things. Most young children are so active this is rarely a problem, but some girls will need to be required to go play outside or they will spend each day just sitting and drawing. While sitting still is great, exercise is also important. Girls tend to want to stay close to you. My girls love to be in the same room as I do when I am doing something–even if we aren’t necessarily interacting, they just want proximity to me. My son is more apt to run off and do his own thing. I have noticed when I get together with moms at the park or at the church that the girls will often spend some time just sitting next to mom or on mom’s lap, while the boys will usually run off and play the entire time. This can be attributed to introvert/extrovert, however, I have found even the introvert girls will want to be close to you. The difference is the introvert girl might be close to you but do so quietly, while the extrovert girl might be soon getting bribed to be quiet for just two minutes. A tip for the close girl: allow for time each day when you do things together in the same room–even if you are doing different things. Being close will help her feel close to you emotionally. Girls play very differently from boys. Boys tend to be very physically active while girls will sit still (go back to number two). Boys get more silly when playing. Girls can get silly. My girls get very silly…if their brother is home. They jump on his “train” and follow his silly lead. They can wrestle with the best of them. If he is not home, they play rather quietly and rather calmly. I would argue this is more personality than gender related except that the same is true for McKenna, who loves to laugh and loves to move. Her natural disposition is far more in this way than my son’s, yet he is still the sillier one who moves more. Girls will sit and play ponies, dolls, barbies, puzzles…boys like to pretend play some elaborate battle scene or run around with balls. Yes, girls can enjoy those things. Yes, boys can sit still and play (especially with a toy like Legos). In general, you will notice girls are more content to sit and play and boys are more inclined to be moving when playing. You will also notice they way they play is different. Girls play in a much more nurturing way than boys. When I was pregnant with my oldest daughter, I got out some of my old dolls to put in her nursery. I gave one to my then 18 month old son. He looked at it, then threw it to the ground. Picked it up and threw it again. I was a bit surprised and worried about bringing a baby home! He was fine with a real baby :). But his play with the baby doll was rough. I compare that to Brinley at 8 months old, who was gentle and nurturing with dolls even at this young age. A tip for the quiet girl: Enjoy it! Seriously. Those quiet moments help offset the seemingly endless chatter. This is really the biggest difference for me because it is the hardest thing for me to work with. Girls are emotional. Books I have read on the psychology of boys argue that this is because we have trained boys to not show their emotions. While I do think it is true that boys are often raised to keep emotions hidden, I do think girls are by nature just more emotional. Sometimes girls just cry for no reason. And we women know all about that! Sometimes we just cry and we don’t really know why. Girls can just be emotional and it can be hard to know what to do when she suddenly breaks down for no apparent reason. Boys can cry, yes. By emotional, i don’t mean fits nor tantrums. I mean child crying because you blinked ten times instead of nine, or you stepped with your right foot firsts instead of left. Roller coaster of thrilled one minute and sobbing the next. A tip for the emotional girl: Listen to her concerns. Hold her. Let her “get it out.” Repeat what she tells you about why she is upset; this will help her know she is understood and will allow her to clarify if you are not understanding what she means. The differences between boys and girls can be quite striking. Some differences make one easier than the other at different moments. What one parent finds easier, another will find harder. Some introvert parents might feel suffocated by the constant presence of the girl, while the extrovert parent might typically love that. Some parents might love the endless energy of boys, while others will find it draining. No matter the natural tendencies and the qualities, we can nurture certain things in our children. We can teach our children how to appropriately express emotions. 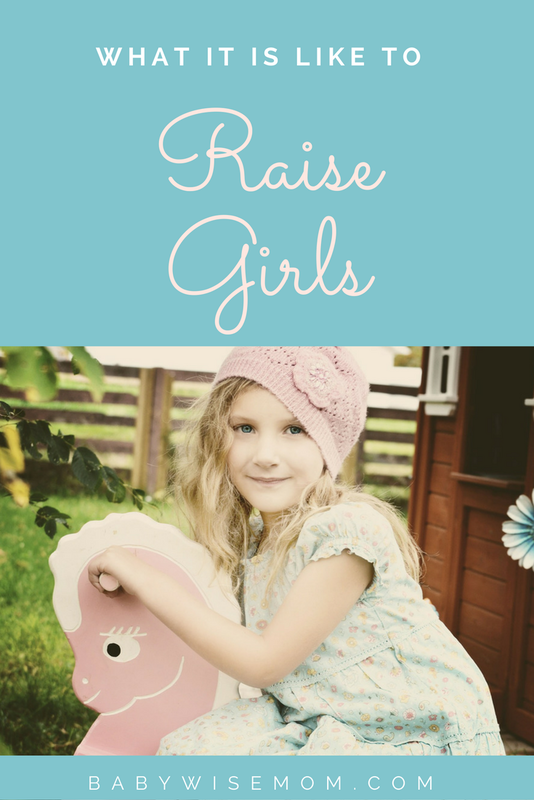 We can teach a boy to sit still and encourage a girl to play on her own. We can also accept and embrace these natural differences. I believe they are innate in our nature and help us to be who we were intended to be. So let us as parents nurture these natural qualities and draw out the virtue of each while we attempt to quiet the vice side of each.